Since I live in Sheffield and not Paris, I downloaded a photograph of the Eiffel Tower from the internet, using Google Images (a wondrous reference tool for illustrators – I remember the days when I had to travel to the library and trawl through books). The Eiffel Tower is a tricky shape. Not bad, but a bit boring. 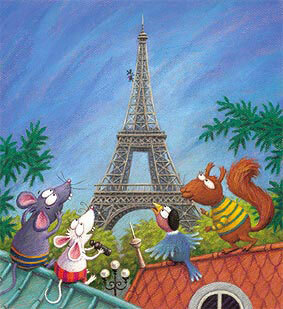 So I made the tower smaller, to open up more foreground, where I could introduce the little Parisian animals sitting on the rooftops, watching Giddy climb. I gave the mouse binoculars, the bird a beret: I was having much more fun. Then I moved Giddy a little higher up the tower, to balance the composition. Much better all round! 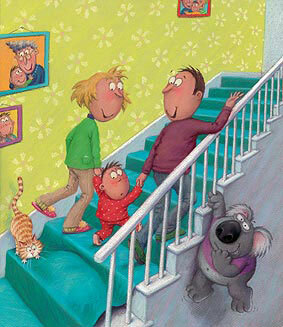 Towards the end of Bears on the Stairs, when it’s well past the little boy’s bedtime and he gets taken upstairs by his parents, Julia Jarman’s text says ‘…the bears all hide.’ This presented an interesting challenge: I needed the 3 bears to stay on the staircase, but where on earth could I hide them, given only one of them is even vaguely small and I had no furniture to help me? It was also important that, though the family in the book mustn’t be able to see them, the child reader should be able to spot them. 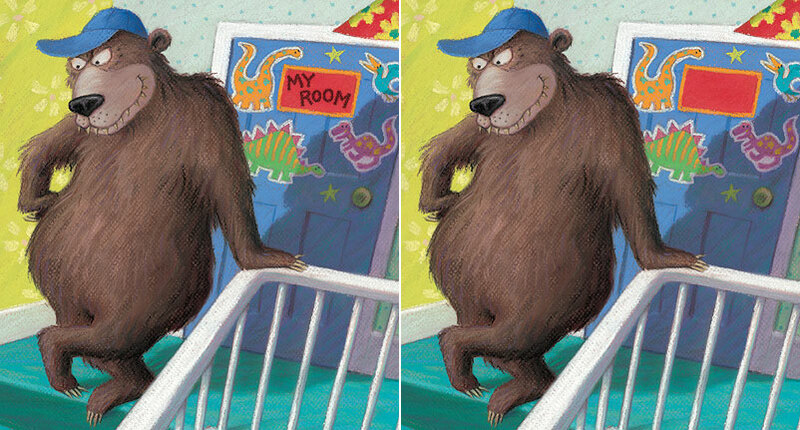 I was concerned that having him hanging unseen above their heads could be a little scary, so I drew the bear giggling, to diffuse anything sinister about the image. 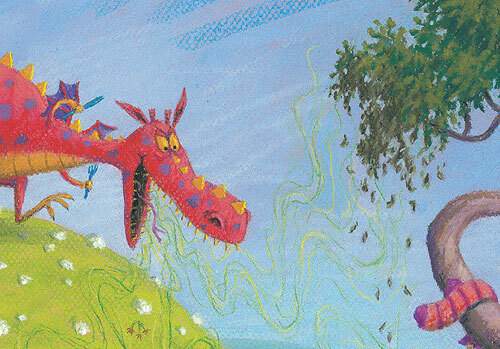 In one of the many chase scenes in Dragon’s Dinner, Susannah Corbett’s text describes the dragon’s breath as ‘quite foul’. 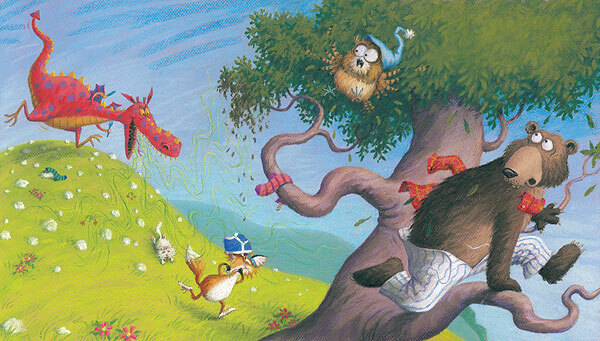 Anything smelly is a bit of a gift in a children’s book. I drew the closest animals pulling faces and holding their noses, but it wasn’t quite enough, as they were in the distance and too busy running away for me to make a song and dance of their body language. Before I begin work on a book, I ask the publisher to print me ‘layouts’ of each page, at the actual size, incorporating the appropriate text. I can move the words around, but this indicates how much space I need to allow. I sketch directly onto the layout sheets in pencil, designing how I think the page might work and trying to capture the images that are in my head. 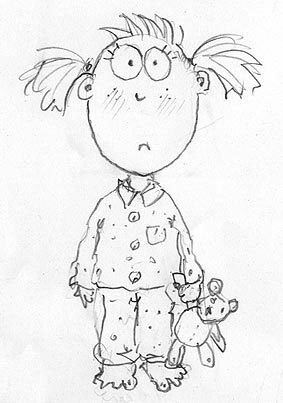 Above is my first sketch for a page from Giddy the Great. 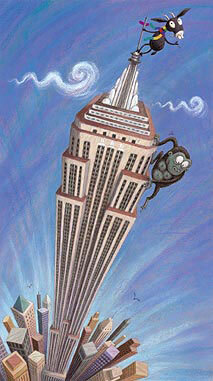 Giddy Goat has just climbed the Empire State Building, but is missing his friend Edmund. 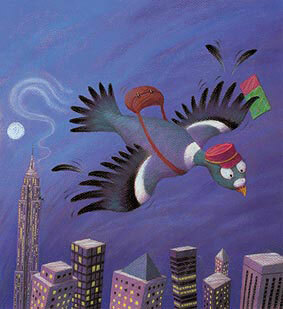 So he sends him a letter, by pigeon post. 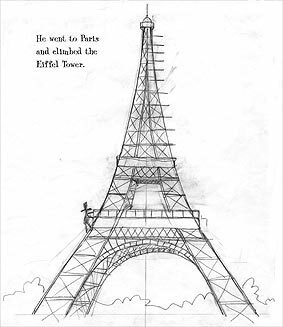 I don’t necessarily draw the illustrations in order, and had previously been working on a drawing of Giddy climbing the Eiffel Tower. 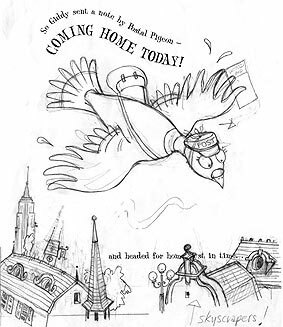 Which is why I accidentally drew the pigeon postman flying home from Paris and not New York! Luckily I spotted my mistake: you can see my note at the bottom. The penny finally dropped as I added in the tiny Giddy climbing down the distant Empire State Building, which of course didn’t fit the rest of the picture. 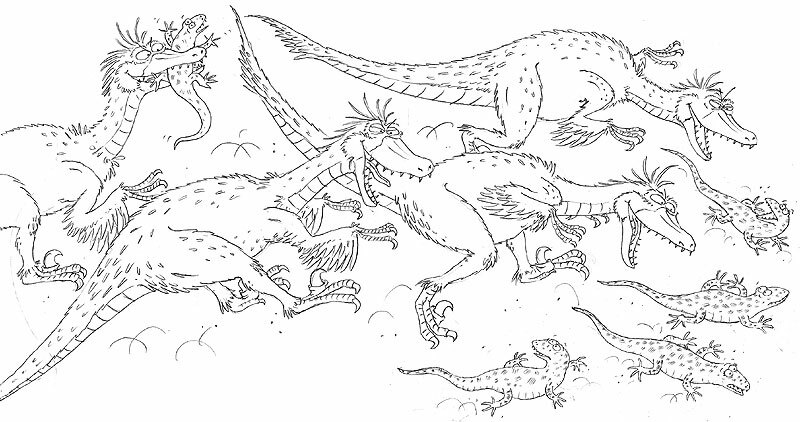 It is vital that all text is left off the original drawings, to allow for translations. Any words are added later, so they can be changed with ease and minimal expense. Notice too, that the added wording is almost always black, like the main story text. This also keeps costs down – everything that might need translating is printed as a single, black layer on top of the colour. I drew the word ‘Jungle’ on my computer. I am able to scan in the textured paper I use for my illustrations, then draw on this ‘virtual’ paper with ‘virtual’ black pastel, so it looks just like the real thing and blends seamlessly when it’s placed over my illustration. 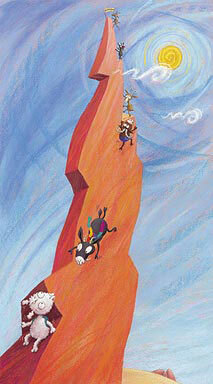 Half way through Giddy the Great, Jamie Rix wrote that Giddy Goat climbed the Empire State Building. I had to squeeze what was once the tallest building in the world, into a single spread. Even by turning the book through 90%, it was very hard to make it look high enough. Luckily, my illustration style allows me to twist and bend reality, so I was able to exaggerate the basic rules of perspective. By pinching in the bottom of the building, I made it look much further down and, by the same token, expanding the top brought that nearer. This created the illusion of greater height, so I effectively stretched the building, without taking up any more space on the page! I reversed things so that we could get close to the action with Giddy and Edmund, who were lower down the mountain. The top is tiny, to make it look far up in the sky, while the bottom is larger and appears up close. 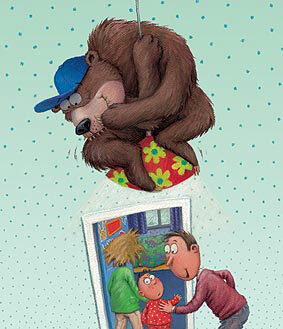 Bears on the Stairs is about a child who is scared to go to bed. Julia Jarman’s story is written in the first person and so never makes reference to whether the child is a boy or girl; which meant I could choose. It is very important to UK publishers that their picture books work for the American market: a US co-edition is, more often that not, the key to the financial success of a project. Unfortunately there are many small ways in which our worlds look different and an illustrator is usually asked to change their work to fit the American model. 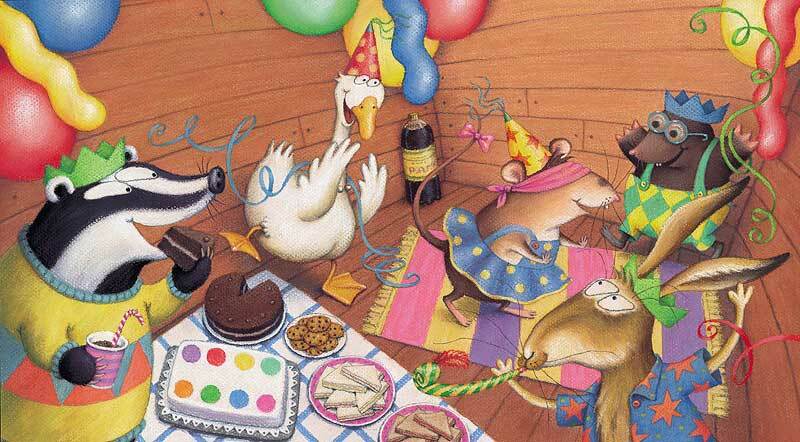 In this original illustration of Smudge’s birthday party from Miriam Moss’s ‘I’ll be your Friend, Smudge’, I drew plates of cute, triangular sandwiches. 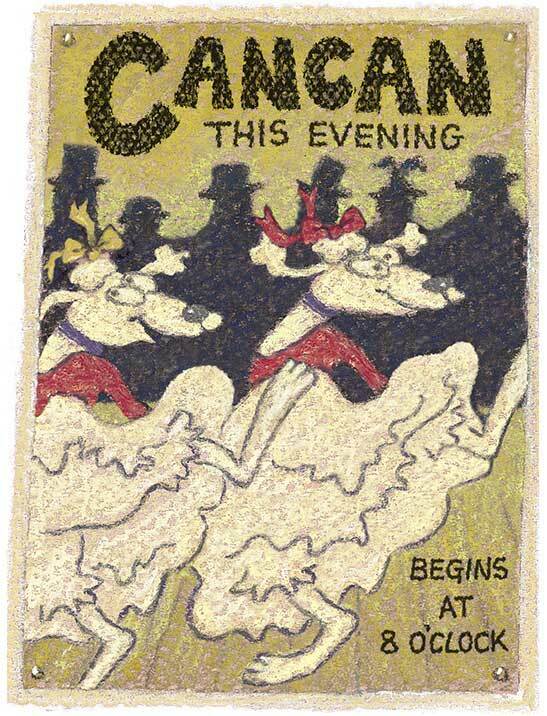 It was not until my artwork was finished that my publisher discovered Americans don’t eat sandwiches. I had to draw a little, pastel drawing ‘patch’ of some bread rolls, which I carefully pasted into the illustration digitally, using Photoshop. 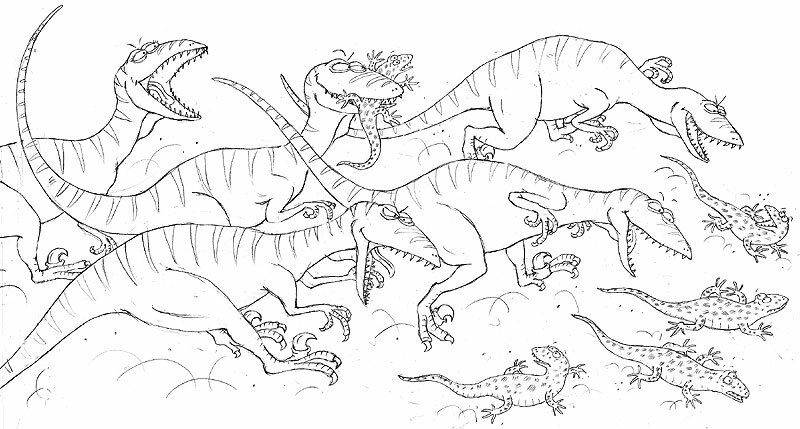 Once upon a time, it would have meant starting the whole illustration again! Take a look in the printed book to see the difference. A similar fate befell the traditional, round teapot I originally drew in the illustration above, from the first book in the Smudge and Stripe series, ‘A New House for Smudge’. A teapot felt far more in keeping with cottage life than this rather posh coffee pot, but American’s don’t drink tea either. At least this anomaly was spotted at an earlier stage, before I began the final artwork. My Very Own Dinosaur Specialist! Designing the characters for Tony Mitton’s poems in Gnash, Gnaw, Dinosaur! was a little unusual. I had to give them all personalities and create the usual lively, believable characters, but I also had to make sure they were completely accurate. 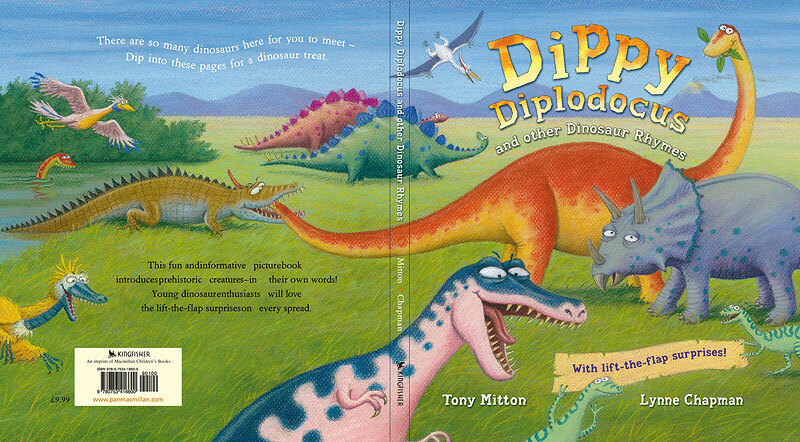 To help me with this, the publisher gave me an actual palaeontologist to work with! He sent me reference material to work from and every drawing needed his approval. He would email me feedback like: ‘the wings should be slightly longer’ or ‘narrower head please’. 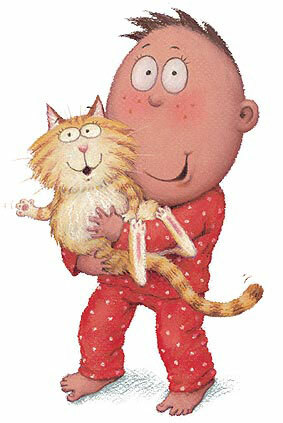 I have illustrated two picture books of Tony Mitton’s poems. 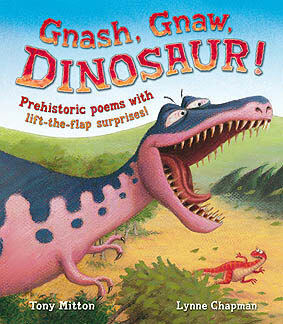 The first one was Gnash, Gnaw, Dinosaur! 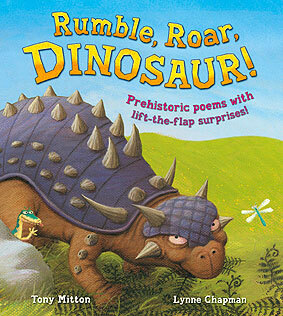 (published in 2009), but the artwork for the sequel, Rumble, Roar, Dinosaur! (published in 2010) was actually drawn at the same time. There were some changes at the publishers in the middle of the project, and it was decided to split the project into two books. I had to do a bit of extra drawing and Tony wrote an extra poem, but it proved a great idea: both books work really well. 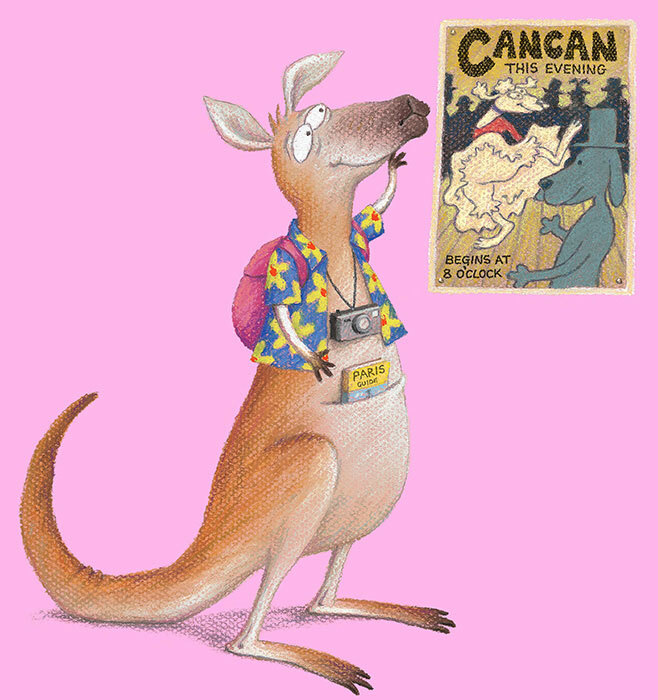 For some reason though, the publisher was still not happy: at the last minute, the poster was removed entirely, leaving Kangaroo on his own, staring up at nothing! I don’t suppose other people notice, but it bugs me. I would have done something far more interesting with him, had I been given the chance!